Yesterday, the BTC exchange rate suddenly started growing, probably as a part of a recovery move against the existing downtrend. According to CoinMarketCap, the current BTC exchange rate is somewhere above 7500 USD/BTC. Over the last 24 hours, the world’s first cryptocurrency has gained some 5%, trying to recover from May’s downtrend (in case you don’t know, the coin has lost 20% since early May before starting to recover yesterday). NordFX experts assume that the BTC rate is currently trying to stabilize, and so are altcoins, after the artificial rally seen in late 2017 driven by the news about Bitcoin futures introduced to American exchanges, which was followed by a market crash that’s been in progress ever since. 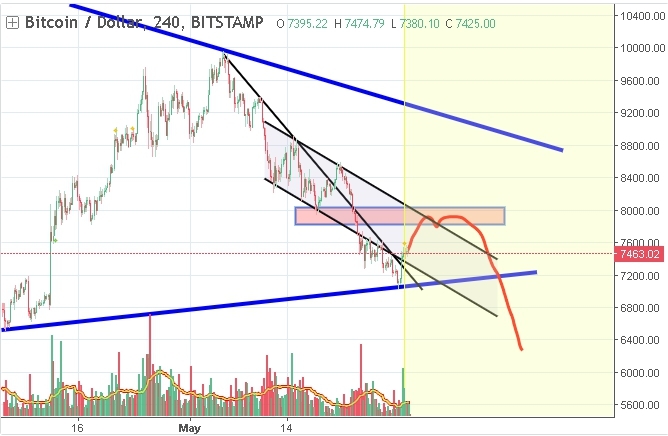 Most experts share the opinion that 8000-9000 USD/BTC is a fair price at this point. Brian Stutland of Equity Armor Investments has made an interesting observation. He shared this observation during his interview to the CNBC. According to Mr. Stutland, there is some kind of dynamics correlation between Bitcoin and the so-called Wall Street fear index (also known as the VIX). To be more specific, the world’s first cryptocurrency has become some kind of indicator signaling risk growth in the banking sector. The current recovery in the BTC market indicates that it’s time to transfer funds from your bank account into your e-wallet. Other altcoins are following Bitcoin. Over the last 24 hours the following altcoins have gotten stronger as well. Ethereum gained 8%, Ripple - 9,5%, Bitcoin Cash – over 12,5%. The total crypto market cap has reached 330 billion dollars, with Bitcoin making up for 38,9% of the market.